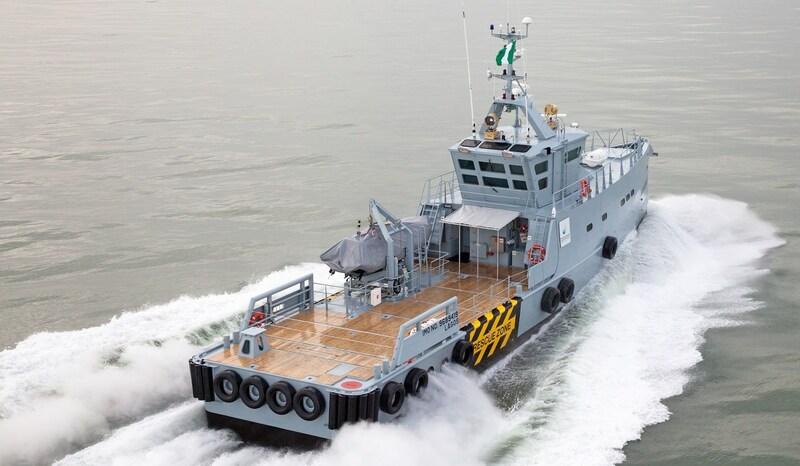 Homeland Integrated Offshore Services Limited (HIOSL) has taken delivery of a Damen FCS 3307 Patrol, to be deployed offshore Nigeria, in the next few weeks. Established in 2006, HIOSL serves the Nigerian oil and gas industry with a wide range of maritime, security and logistics services. The Lagos headquartered company has ambitious plans to become the leading marine logistics provider in the Nigerian offshore industry. The Damen FCS 3307 Patrol, to be named ‘Guardian 1’, has just undergone sea trials in the Netherlands and will soon set sail to Port Harcourt, Nigeria. Guardian 1 is the company’s third patrol vessel. Guardian 1 will be used for maritime security purposes, crew transfers and supplying cargo and provisions. The company also works very closely with the Nigerian Navy. As well as patrol vessels and tugs, HIOSL provides equipment for the producers, supplies house boats, barges and cranes, and the company operates one of the largest crawler cranes in Nigeria. The Damen FCS 3307 Patrol has the pioneering ‘Sea Axe’ bow that gives the vessel unparalleled seakeeping behaviour, even in challenging conditions. The 30 knts vessel is extremely fuel-efficient and can also transport cargo on its aft deck to the offshore rigs. Mr Ekere adds: “We want to increase our fleet and become the market leader in the industry. Therefore we would like to secure two more patrol vessels and two Platform Supply Vessels, ideally in the next few years. With offices in Lagos, Port Harcourt and Warri, the company is also considering expansion into Ghana. HIOSL has a core staff of around 100 and a total of 400. Recently, it was also awarded a $64m manpower services contract with a leading oil major for providing 105 staff, including engineers, drivers and technical services people. Damen will also arrange the delivery and commissioning of the vessel, provide training for local crew and engineers and it will deliver a spare parts package.